Several claims about the dangers of pot have been doing the rounds with no one sure of either their validity or origin. This post from Buzz Feed News collates the evidence from real scientific research on marijuana to test some of these high profile marijuana myths. Pot is a gateway drug. Pot is as addictive as heroin. These and other claims are constantly repeated. But are they true? A group of scientists has some answers. Researchers at the International Centre for Science in Drug Policy spent the past year examining the best and current scientific evidence about marijuana to see which of the most common claims about pot stand up to scrutiny. They’ve turned that work into Using Evidence to Talk About Cannabis, a new project that puts scientific evidence into plain language so people can understand, and act on, the truth. 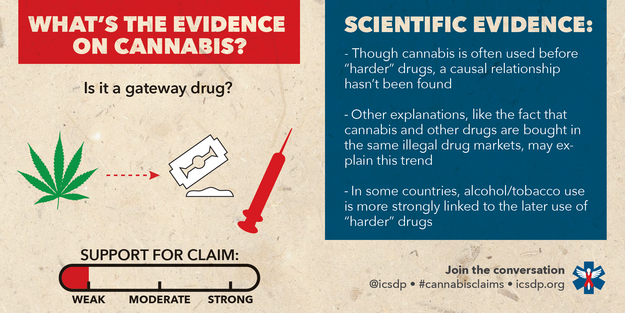 “Over the past year we’ve been working diligently on scanning the news media and online conversations about cannabis to identify the most often repeated or high-profile claims related to its use and regulation,” says Dr. Dan Werb, director of the ICSDP. 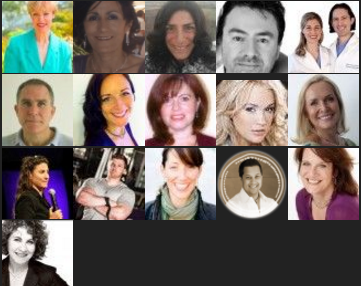 They took the list of claims and reviewed all relevant scientific research. Their findings were then peer reviewed. Here are six of the most common claims about marijuana use, and what the current scientific evidence says about them. 1. No, pot is not a gateway drug. 2. 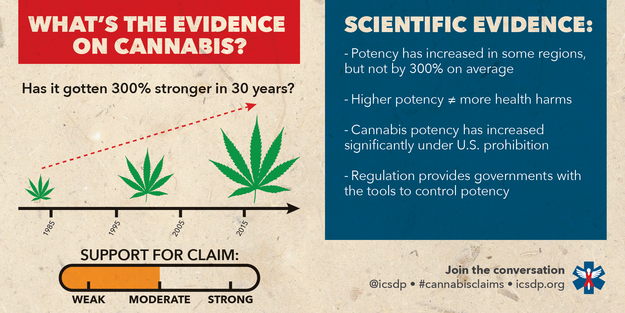 Marijuana has gotten 300% stronger over the past 30 years — but only in some places. The THC levels of marijuana have increased in recent decades. But the amount of that increase differs by location, according to their findings. 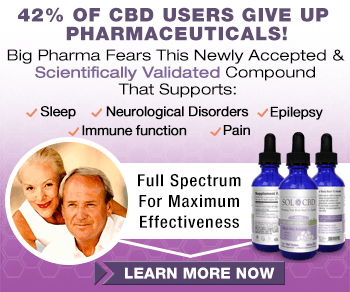 They also caution that the THC level is not the only factor that determines potency. Yet another reason to avoid tobacco products! 3. 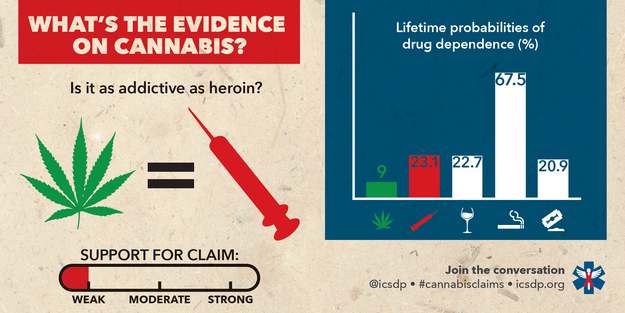 No, marijuana is not as addictive as heroin. In contrast, the probability of becoming addicted to heroin is estimated at 23.1%. 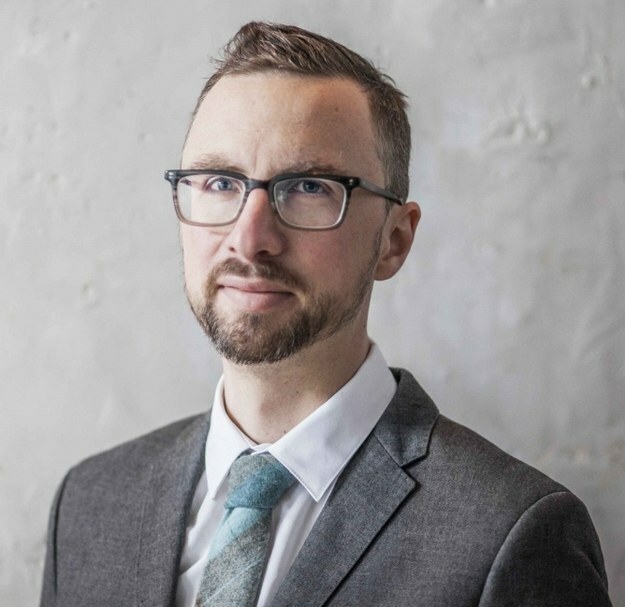 “The evidence tells us that the vast majority of individuals who experiment with cannabis will experience no serious adverse effects and that legal psychoactive drugs like alcohol and tobacco are much more harmful and addictive,” said Dr. Evan Wood, Canada research chair in inner city medicine at the University of British Columbia, who worked on the project with the ICSDP. 4. No, marijuana does not cause schizophrenia. 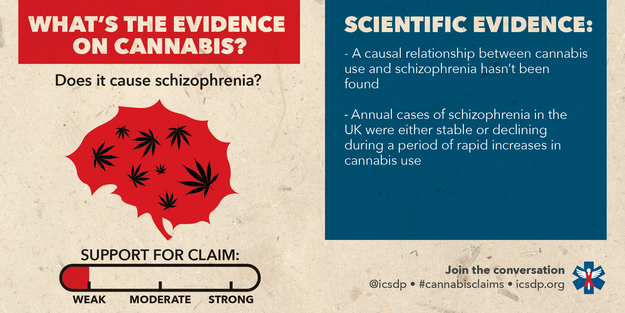 There is no evidence to suggest a causal link between marijuana use and schizophrenia, according to the researchers. 5. 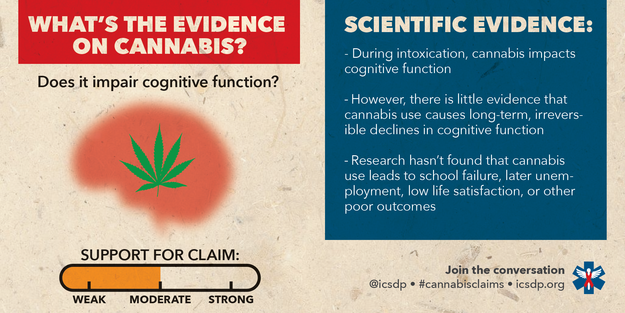 Marijuana impairs some cognitive functions, but the effects vary by person. 6. 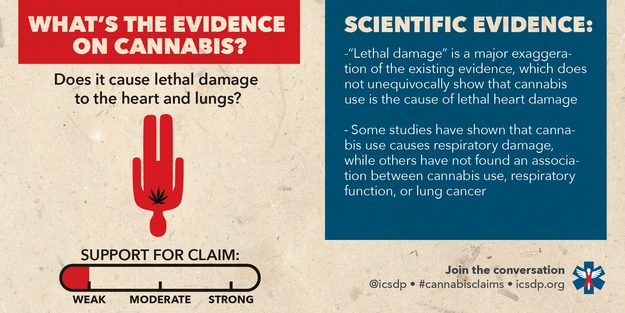 No, marijuana does not cause lethal damage to the heart and lungs. There is no conclusive evidence of a link between smoking marijuana and experiencing lethal heart and/or lung issues. But it’s also an area the researchers say needs more study. More detailed information, including a list of the papers that were reviewed and cited by the ICSDP, is available here.